There has been a lot of silly commentary about the European model getting the right solution sooner than the U.S. model. While true, it didn't matter. 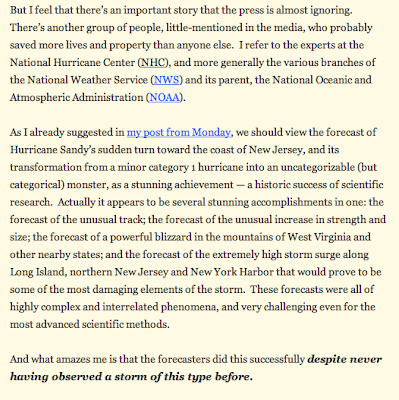 Meteorologists knew the models' biases and made the right call (see here). 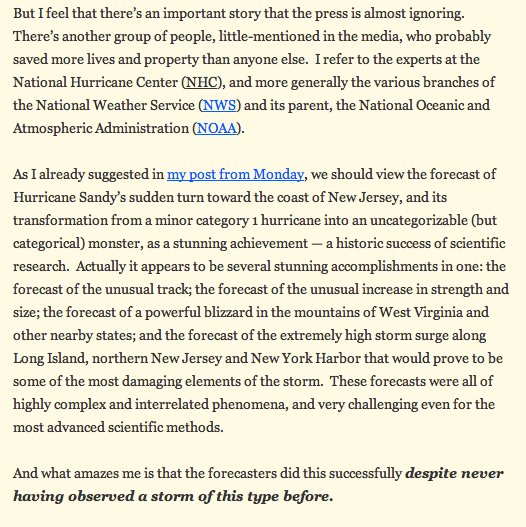 You'll see at the bottom of that posting I made a comment about the omission of the incredible work that broadcast meteorologists and private-sector meteorologists (like AccuWeather) did to keep people informed and safe. Given the tens of millions without power, I'm sure they were glad to get the advice more than four days before Sandy arrived to stock up on staples, fill gas tanks, etc. How did Lowes manage to know which stores to keep stocked on an emergency basis? AccuWeather! Meteorology is playing an ever-more crucial role in saving lives and keeping our economy strong. There is a great book on this subject (I wrote it!) if you'd like to learn more. I am a subscriber to Accuweather Pro. I saw what Henry M., Paul P. and company were putting out as Sandy forecasts. And unfortunately, they were poo-pooing the Euro solution and used waffle language until the GFS came around in day 5 time frame. About the same as the NHC. PS. I also subscribe to Weatherbell Analytics. They a much better job.